Two suspects are believed to have been detained by police but the motive for the attack is currently unknown. Reports suggest one of the attackers tried to flee by jumping off a bridge but was detained by officers. The attack comes months after a terrorist attack on a Christmas market in Berlin killed 12 and injured 56 more after a lorry was driven into crowds of shoppers. DÃ¼sseldorf â€“ Der Albtraum beginnt um 20.51 Uhr am Donnerstagabend in der S 28 am DÃ¼sseldorfer Hauptbahnhof. Ein Angreifer schlÃ¤gt laut Polizei mit einem Beil offenbar wahllos auf Reisende ein. Erst in der S-Bahn, spÃ¤ter am Bahnsteig von Gleis 13 und sogar noch in der Bahnhofshalle. Am Boden der Halle ist nach der Attacke eine Blutspur zu sehen. Insgesamt fÃ¼nf Menschen (drei MÃ¤nner, zwei Frauen) werden verletzt, eine Person sogar schwer. Panik, Chaos, Polizei-GroÃŸeinsatz. Hubschrauber steigen auf. Der Zugverkehr wird gestoppt, der Bahnhof abgeriegelt. DÃ¼sseldorf - The nightmare begins at 8:15 pm on Thursday evening in the S 28 at DÃ¼sseldorf's main station. An attacker, according to the police, apparently indiscriminately hits a traveler with a hatchet. Only in the S-Bahn, later on the platform of track 13 and even in the station hall. At the bottom of the hall is a bloodspur to be seen after the attack. A total of five people (three men, two women) are injured, a person even hard. Panic, chaos, large police force. Helicopters rise. The train is stopped and the station is closed. Five people were injured on July 18, 2016, when a man with an ax attacked passengers on a train in Wuerzburg in Southern Germany, according to the BBC. The attacker, an asylum seeker from Pakistan named Muhammed Riyad, was fatally shot by police. Police said Riyad left behind a martyrdom video, which was distributed by ISIS. He claimed he was instructed by ISIS to use an ax in the attack. ISIS has distributed materials to its followers instructing them to attack using whatever method available to them, whether it be with a gun, a knife, an ax or a vehicle. Soon the trains will have TSA viper teams on them. Sad. NATO's inspector general was assassinated while investigating NATO's funding of "anti-terror" operations, so I'm leaning on the false flag explanation given past history. Attacker in Dussldorf was Albanian from Kosovo: Muslim Fatmir H.
Yes I knew it was funny when last night the news was saying " from the former Yugoslavia! and specifically avoiding saying the "M" word "Muslim" or the "I" word Islam ... Also typical is that TWO were taken in custody , but only ONE is named and charged . So was the other perp the handler ? Earlier, a spokesman for federal police had said two people were arrested and further attackers might be on the run. This was later corrected by police who confirmed only one arrest. MSM in disinformation go further ! Well, they have reported that the killer from Serbia ( only then Kosovo belongs Serbia !). To make matters worse these "news" is transmitted and in Serbia. From word to word. I forget when MSM breaking news: " Islamic terrorists came from Serbia" and people mean "those bastards Serbs". However, those Muslims ( "Bosniaks" ) and Albanians from Kosovo which formally a citizens of Republic of Serbia. Reuters said the demonstrators were Serbian ultranationalists protesting Bidenâ€™s one-day stop in Belgrade before his visit to Kosovo. Demonstrators wore shirts displaying an image of Trump, the Republican presidential nominee, the news outlet added. Biden voiced sympathy for Serbians who died during NATO's bombing of Serbia in 1999. Know Your Albanian National Anthem! 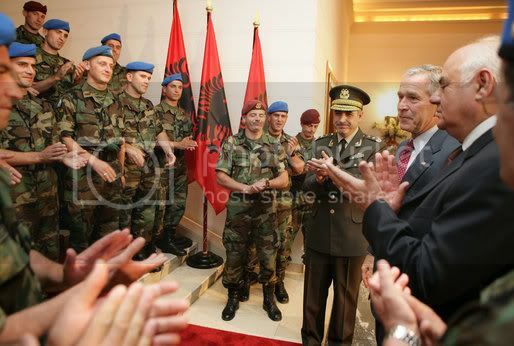 Bush in Albania - 2007 - Never did Bush move among the "people" as he did in Albania. Don't Forget Yugoslavia! Bush AND Clinton need to be tried for war crimes! During the negotiations between Serbia and representatives of Albanians from Kosovo through M. Ahtisaari ( Bilderberg Group ) , George Bush Jr. said Albania "sooner or later, Kosovo should be independent." Soon Mahti Ahtisaari "proposed" plan of Serbia that Kosovo is an "supervise independence" ". Serbia has refused a "Ahtisaari plan" is not accept UN Security Council because it is Putin's Russia vetoed ! However, the NWO has awarded the following year with the Ahtisaari Nobel Peace Prize ( sounds familiar ? ). Bush Jr. he said that's what happened. Albanians in Kosovo unilaterally declared independence from Serbia. Police have ordered the shopping centre to stay closed due to "concrete indications about a possible attack". Police have released no information about the nature of the attack. However, sources close to the investigation say a group of suicide bombers planned to attack the shopping centre with bombs. Wow no new news on this ... Oh we missed another attack ! An elderly man was attacked with a machete in Dusseldorf on Friday, hours after a similar attack by a mentally ill asylum seeker wielding an axe left nine people injured at the city's train station. The 80-year-old machete victim, who has not been named, was rushed to hospital after being assaulted in a car park on the northern outskirts of Dusseldorf. His attacker remains at large. Teachers and students at the nearby Theodor-Fliedner-Gymnasium were told to stay indoors, while police cordoned off a woodland area near Kalkumer Schlossallee, the site of the car park. Hours before he was attacked, a 36-year-old man from Kosovo wounded nine passengers with an axe at Dusseldorf train station before trying to escape by jumping from a bridge onto a street, where he was arrested. Prosecutors said the man, named locally as Fatmir H, came to Germany in 2009 and was granted temporary residency for humanitarian reasons. 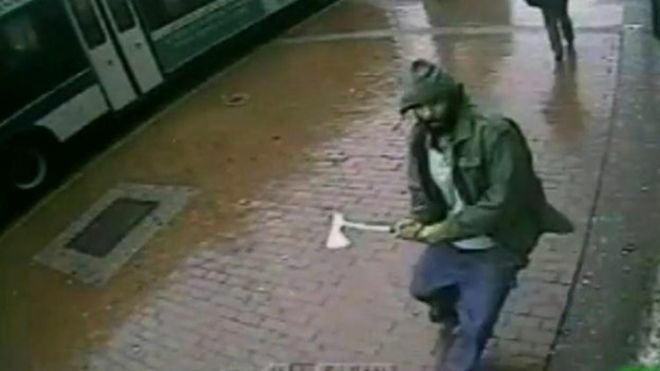 "I have experienced a lot, but I have never experienced anything like this," said one eye witness of the axe rampage. "We were standing on the track, waiting for the train. The train came, and suddenly someone jumped out with an axe, hit the people. There was blood everywhere."